There’s an “Add a new [entity]” button at the bottom of (most) search result menus, which upon clicking will open up a dialog in the page. The dialog contains a form identical to the one you’re used to when creating entities the old-fashioned way — that is, from the Editing menu at the top of the website. Once you’ve successfully added a new entity from the dialog, it’ll be automatically loaded into the search field you started from. Another change that went along with this feature (that editors should be aware of) is that we now require artists and labels to be selected on the “Release Information” tab of the release editor. Previously, you could enter plain text into these fields, proceed to the next tab without selecting a search result, and handle creation on the “Add Missing Entities” tab. Because “Add Missing Entities” has a very limited UI, in the future we’d like to remove it in favor of easier entity-creation on the other tabs. This is a small step towards that. 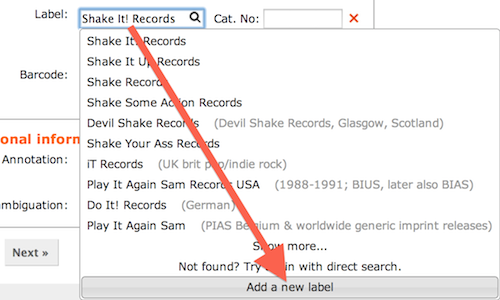 Note that you can still use “Add Missing Entities” for track artists — this change only affects the release artist and release labels on the first tab. On Sunday, December 29th at 1pm PST, (2pm AZ, 4pm EST, 9pm UK, 10pm CET) we’re going to swap out our network switch. 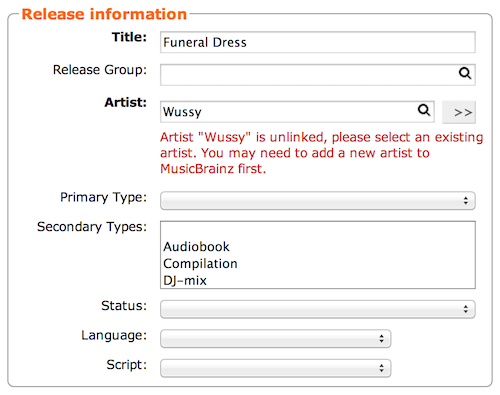 During this time all MusicBrainz sites hosted in California will be unavailable. (that is all sites, save for the primary and secondary FTP mirrors and the FreeDB gateway). We hope that this outage will last only 10-15 minutes, but as these things typically go, you’ll never know how long it will really take. Another two weeks and once again, a nice pile of fixed bugs! Thanks to uk/chirlu and reosarevok for fixing a few bugs along with the MetaBrainz team. 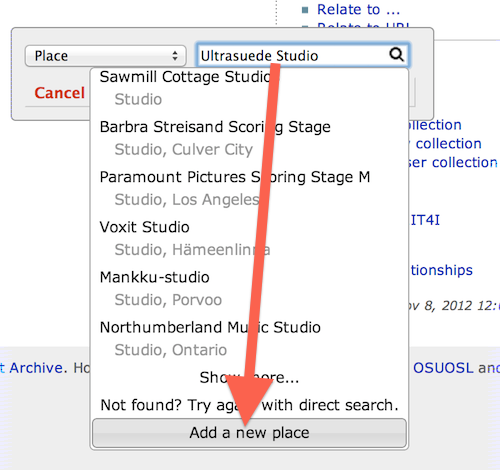 It’s now possible to get an add-entity dialog right from the inline search fields. This should make it much easier to add relationships, especially, as well as creating new artists and labels where needed in the release editor. This also ends up improving the already-existing dialog for creating works in the relationship editor, to include the full functionality of the add work page. We’re hoping to get a fuller blog post on this feature up in the coming days. The artist overview now filters out many release groups by default, for a less cluttered view that should more reliably include only the main discography of bigger artists, rather than including a lot of bootlegs, concert recordings, and other releases that aren’t always useful to see. Of course, there’s still a button to see all release groups. Perhaps less obvious than other changes, but a lot of colors and some other minor styles have changed slightly on the site, as part of a reorganization of our CSS files. … and, of course, the usual crop of bugs and small improvements. There’s a full list below. The tag for this release is v-2013-12-23. [MBS-7061] – The tracklistings are gone in the release view. [MBS-7066] – Load area codes in initial load, instead of separately. [MBS-7067] – Use rel=nofollow on external links. Yesterday evening I had a call with my contacts at Amazon and a person from the Accounts Payable department. Over the last two days they were able to work out the kinks in their accounting with regard to the MetaBrainz Foundation. They verified that the outstanding invoices from our perspective were correct, including the now infamous invoice #144. Shortly after the call, a check for $22,500 was cut and will arrive in California by 10:30am today. I’ve also received a complete history of all of the payments made to the MetaBrainz Foundation and I’m happy to say that everything looks great to me. Also, an issue surrounding this invoice was pointed out to me: If invoice #144 wasn’t outstanding, all of this would’ve been a bit drastic. I agree with that, but what I failed to mention in my last blog post was that if invoice #144 wasn’t paid, then invoice #200 (which is 3 months younger than #144) was outstanding. The matter at hand was that there was a 3 year, or a nearly 3 year, old invoice outstanding. Personally, I really wanted to gain clarity around what happened nearly 3 years ago and finally put the issue to bed. Finally, I would like to commend Amazon on how they handled matters in the last week. When prodded hard enough, Amazon got their act together, got to work and figured out this mess and then swiftly cut a check. I’ll keep posting updates about this until the check is in the bank and has cleared, but it certainly looks like we’re heading to a complete resolution of this matter early next week.